Ladybug, come to me now! Time to bring out the toddler ladybug costume! A ladybug is a very special bug—good for the garden, fun to look at, and so clean you can allow her to walk all over with your fingers with never a worry. It’s a very cute choice for a little one’s dress up costume. 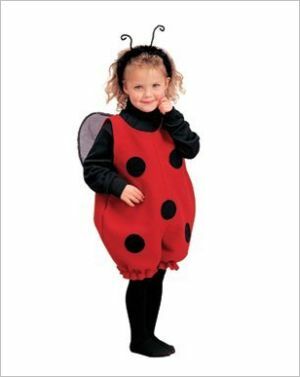 If you are making your own costume, the key is a red, black spotted body—perhaps with wings-- and a little headband with antenna. Ladybug arms and legs are black and skinny in real life, but you can also go with red black spotted leggings if you’d prefer. What about if you want to buy your toddler’s costume? You’ll find no better selection than online; just make sure you choose the size carefully. Here we’ll look at three of the cutest little girl’s ladybug costumes; a romper, a cape, and a little red dress. 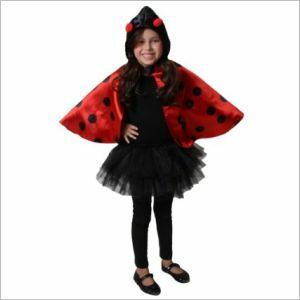 If you’d like your daughter to just wear a cape over her regular clothes—or over some black jeans and a black turtle neck, for full effect—you can also buy the Red Satin Polka Dot Ladybug Cape. This cape will fit children from around 2 to 7; longer on the little people, shorter on the older. The wing section of the cape is red with black lady-bug spots; the head, black, and there are two little pompom antenna attached. It is a fairly good quality costume, and the easy-on, easy-off design makes it ideal for dress up play once Halloween or the masquerade party is over. It is 100% polyester and can be handwashed. Or maybe your little ladybug is all about dresses. One nice dress-style option is Aeromax’s Jr. Ladybug Costume—a red and black polka dot dress with black wings attached and an antenna hairband. This dress is 100% cotton, and the back is knit fabric, which makes it much more comfortable than the average Halloween costume. This is a warm-weather costume, unless you buy a large enough size you can layer a turtle neck underneath the dress; the sleeves are tiny little lacy things. The skirt is also fairly short, so you may want to do tights or leggings even if the weather is warm out. 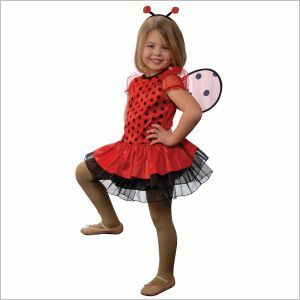 Have fun rigging your little girl out as a sweet red bug—no matter what toddler ladybug costume you end up deciding on, she is sure to look wonderful!